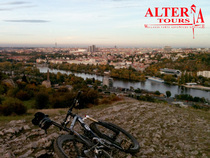 active prague tours: fun & adrenaline ! Description: learn the secrets of off-road driving and test your skills in special ex-army grounds close to Prague. You will enjoy driving a powerful YAMAHA 550 cm3 quadbike, the mythical Land Rover Series and Defender, and russian ZIL army truck under the safe supervision of professional instructors. The event includes off-road driving course and total 1 hour of driving on different vehicles. We provide protective equipment for quadbikes (helmet incl. balaclava, elbow pads, gloves) and course diploma. Ideal for team-building and stag parties. Free GoPro video footage. Departure time: 10 am and 2 pm for groups of at least 4 persons. Other timings available upon agreement. The tour includes: English-speaking guide, off-road driving course, 1 hour of driving, protective equipment, video and photo-reportage with HD action camera. 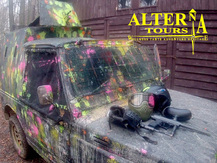 Description: an action-packed guided tour from Prague with exciting paintball games in ex-army area equipped with buildings & trenches, hidden in pristine forest. Games are played on outdoor or indoor fields of varying sizes simulating urban, industrial, natural, and bunker environments to re-enact famous war movies. Professional supervision by English, Italian, French, Spanish-speaking staff. After the game, one more adrenaline shot with off-road driving on Land Rovers. Ideal for team-building and stag parties. Free GoPro video footage on helmet-mounted camera. Departure time: 10 a.m. and 2 p.m. Other timings are available upon clients` requests. The tour includes: English-speaking guide, rental of paintball equipment and protection, 500 shots, video and photo-reportage with HD action camera. TOUR 3: trek in "czech paRadise"
tour 4: trek in "swiss bohemia"
Once-in-a-lifetime adventure in ex-army area close to Prague to test your skills on Land Rover and quad drives, and unique tank & armored vehicle drive ! 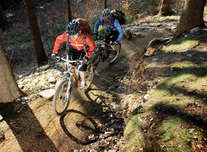 Adrenaline, pure fun, team-spirit meet for an unforgettable day in total safety, with high-quality equipment and unique off-road drive experience!